Visit the places connected to "Neesima Yae"
Last week, we visited some places connected with Neesima Yae by bicycle. Do you know her? Her story has been turned into TV dramas in Japan now. Yae was a Japanese woman of the late Edo period who lived into the 20th century. She herself was skilled in gunnery, and took part in the defense of Aizu during the Boshin War. After the war, Yae came to Kyoto to care for her brother Yamamoto Kakuma, who had been a prisoner of war in Satsuma custody. 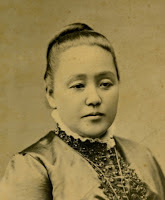 She remained in Kyoto, and became a Christian in the 1870s. Soon after, she married Rev. 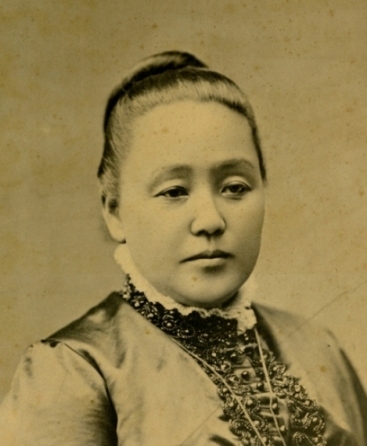 Joseph Hardy Neesima and, together with Neesima and Kakuma, played an integral role in the founding of Doshisha University. Yae was also a tea master of the Urasenke tradition, with the art-name of Neesima Sōchiku. She also served as a nurse during the Russo-Japanese War and Sino-Japanese War. First, we visited Doshisha University. It is about 15 minutes’ bicycle ride from NISHIYAMA RYOKAN. This building is located along Teramachi street. From January 10 to March 18, 2013, there is a special exhibition. Temple's treasures which connect to Yae Neesima are shown to the public. These are on the mountain and we walked a long distance..
You can study the history from the end of Edo period to Meiji period here. Yae had a connection the person who teached Sado in Kennin-ji. it was nice of us that we can take photo freely in the building. thank you for staying our ryokan. We are going to have KOTO concert at our Lobby on Friday from 19:00 (not every Friday). The KOTO is a traditional Japanese stringed musical instrument derived from chinese zithers. It makes very beautiful and elegant sounds. The charge is free and everyone can come and join this concert. We are going to have this concert on March 23rd, 29th, April 5th and 12th. We hope a lot of people can make it and enjoy Japanese traditional music with us.